Live news and features all night from the world's largest independent news gathering organization. An enthusiastic exploration of music from all around the world, from a true World traveler. Glorious R & B from the '30s though the '50s. If like me you're a fan of Rock'n'Roll, Jazz, World, Classical and Standards sung by Sinatra, Anita O'Day, Tony Bennett and others we've got a show for you on KSFR - Bouncing with Bud! Tune in every Friday from 1-3pm with your host Bud Ryan. Cinema Scope covers all aspects of the Film/TV/Media Industry in New Mexico, but it is not just for industry professionals. With insight and humor, host Stu Goswick presents a variety of lively interviews, news and reviews. Cline's Corner interviews the characters of the city who give the city its character. The weekly, half-hour show spotlights artists, actors, authors, chefs, musicians and other people who are doing interesting things in Santa Fe. Earthsongs gives listeners the chance to explore the Native influences that help shape and define contemporary American music. A free form celebration of musical and oral traditions, embracing an uncommon mix of folk styles. Old folk remedies for a new world. Gottadance features dance music from cha-cha to contra, two-step to tango, waltz to waila and hosts occasional interviews with musicians and performance dancers. Youth radio with teens 12 to 21. Music, talk, hangin' out on the radio. PRE-EMPTED FOR LIVE COVERAGE OF SANTA FE CITY COUNCIL MEETINGS TWICE A MONTH. Happiness in Action is a weekly talk show devoted to exploring the deeper meanings of happiness, and why it matters so much. 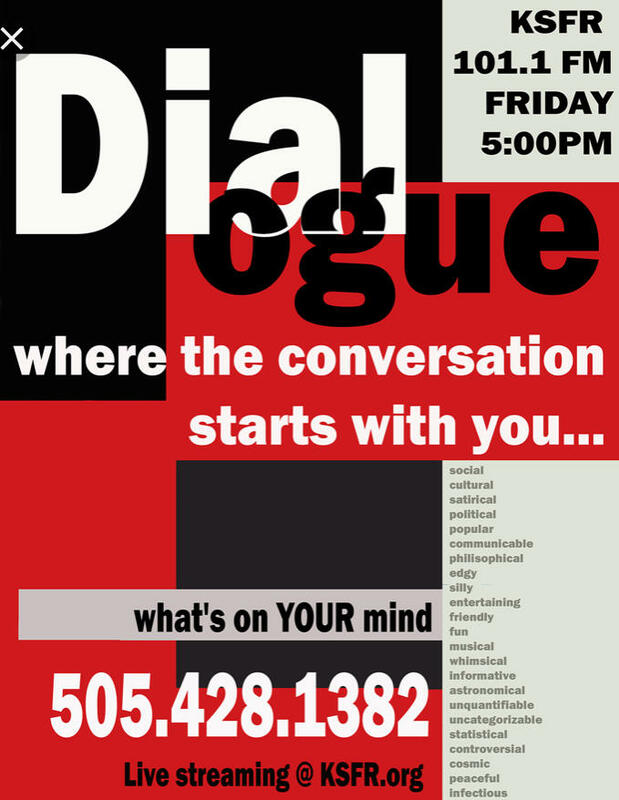 Thoughtful, engaging, light-hearted, wide-ranging, interdisciplinary, cross-cultural conversations every week! A call in show about all types and aspects of relationships, their problems, their dynamics, their triumphs. Every Friday morning dj Helga Ancona brings you music from all over the world, including jazz, classical and an hour of Brazilian music. Exploring the origins of American Jazz, it's sub genres across the decades and the globe, and the individuals who's jazz impressions will never die. At the crack of Thursday morning, when the clock strikes midnight shoving hump day over the threshold into post-hump day, two legendary DJs summon the smartest and strongest songs to fight back against ancient and unspeakable horrors." Eclectic, cool, non-traditional, pushing-your-envelope music. An astrology talk show with a process-orientation, interpreting moon cycles and planetary cycles. Click here for Podcasts of Moonwise. Music with an edge. Political comment with a beat. From Santa Fe's favorite local music maker, the place for Chicano and Santa Fe music. Highly accomplished Santa Fe musician brings you the best in contemporary jazz, with an emphasis on the saxophone.